Welcome back peeps! 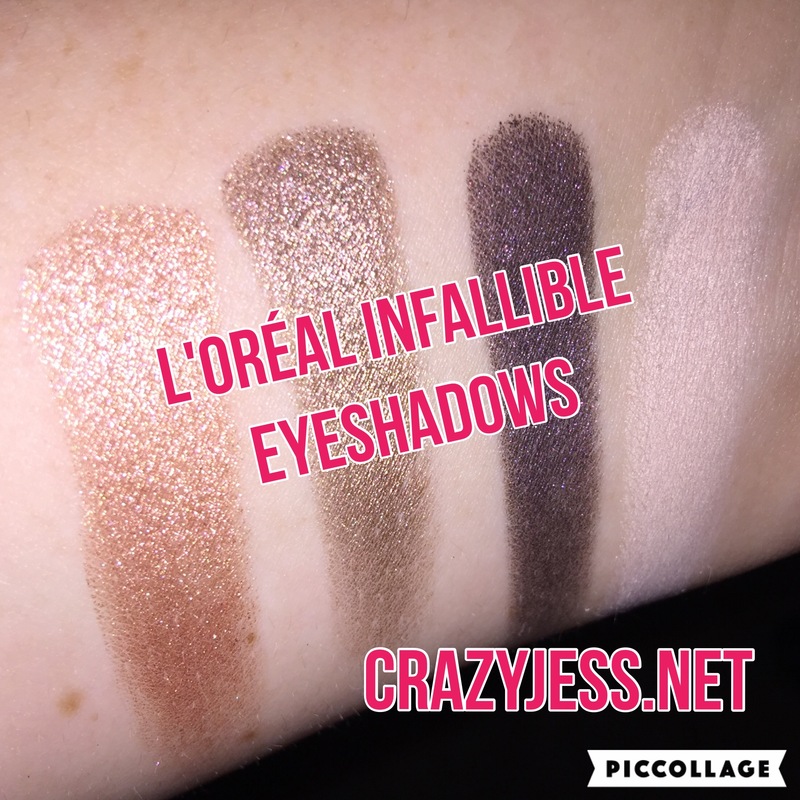 For today’s’ post I wanted to mention my obsession with the affordable L’Oréal Infallible individual eye shadows. I recently found one on clearance at Target and I had a coupon (naturally) so I decided to give it a try. After using it the first time I was instantly in love. When I recently become a foster mom I don’t have the time to get ready like I used to because I was on a demanding three year old’s schedule not mine. Because of that, I perfected the art form of putting on a full face of makeup in 10 minutes or less as quickly as possible with whatever products I could quickly grab. Some days this get ready as fast as you can beauty routine turned out great, other days I didn’t look quite as much of a hot mess and at least looked half-way put together. If you are interested I put together a video of this get ready as fast as you can beauty routine. Check it out on my YouTube channel below! So back to the eyes hadows… They are buttery smooth and go on so easily. They are very pigmented and the ones with shimmer aren’t overly shimmery which I like as well. What I mean by that is that it doesn’t look like I’m on my way to a Ke$ha concert when I wear them. I’m 33 and too old for that mess. I also like that I can apply them with any number of my eye shadow brushes easily OR I can just use a clean finger and gently apply them. After quickly becoming obsessed with the first shade I purchased on clearance from Target, I started stocking up with whatever colors I could find that were on sale and that would work for my skin tone. All of my shades have been purchased at Target or Ulta so far as that is where I have been able to score the best deals. These are in order from left to right (amber rush on the far left and endless pearl on the far right). The flash was on so they look more sparkly and glittery than they really are. I really love these eye shadows. Since they are super affordable and can be found at any drug store or major retailer (Walmart/Target etc) it doesn’t hurt to give them a try if you haven’t already. If you have tried them however, what did you think? What are your favorite shades? Comment below and let me know! Photo sourced from http://www.Ulta.com where you can purchase these amazing shadows!